Why are CareWorks developing Mobile Apps? Health and Social Care professionals are now more than ever required to work in a variety of settings with their patients and clients, often away from their desks. There is an increased demand on practitioners to work smarter, delivering more of the best care possible for less. Such demands are very diﬃcult to meet with the current model of oﬃce based delivery. In recent years, mobile working has helped professionals to greatly increase their output allowing them to spend more time with their patients and clients and less time on administrative tasks. 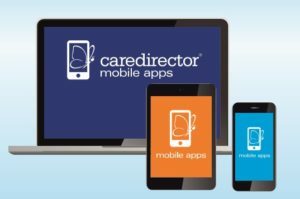 CareDirector Integrate oﬀers a simple, secure alternative to paper based ﬁles and a solution to mobile working. The application puts the essential case information at your ﬁngertips, even when working “oﬄine”. Crucially it enables you to record your notes, activity and ﬁll in forms whilst out on a visit or in the community, dramatically reducing the need to spend at your time desk with a PC.